In early March, to the shock and dismay of free speech advocates around the world, Internet retail giant Amazon caved to pressure from special interest groups and mainstream news outlets and quietly pulled at least 100 political and historical books from its website. Read the report below to see which books were targeted. “Who controls the past, controls the future,” or so said George Orwell in his prescient book 1984. He also warned that, “The most effective way to destroy people is to deny and obliterate their own understanding of their history.” Today, it seems the global thought censors are taking Mr. Orwell literally. 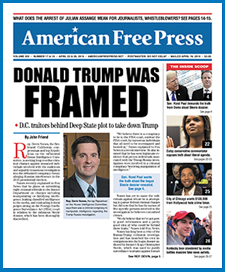 As this week’s American Free Press went to press, we received word that, so far, hundreds of history books and e-publications have been removed in one fell swoop from the largest and most lucrative vending website in the world—Amazon.com, owned and run by Jeff Bezos (currently worth at least $73.4 billion, according to Forbes Magazine). Note that Amazon by itself accounted for 31% of all online sales on Cyber Weekend 2016 and 61% of all online sales growth in 2015, far surpassing all others. Paul Angel is a writer, graphic designer, and publisher and lives in Virginia. The truth is rapidly spreading and the criminals are desperate to put out the fire of truth. The truth does not fear inquiry, only liars fear inquiry. The lies of the holocaust are their biggest trump card and they know it. How do these people live with themselves? Do some of them actually believe their own lies? Or are they genetically psychopathic? Or simply so determined to rule over all the non-Jews they simply don’t give a damn what it takes, ie the ends justify the means. That is why the public is constantly reminded to never forget the “holocaust”. I will never again order from Amazon, and I encourage others to join in the boycott. So I guess the Jew’s triumph again. And Trump is going to help them even more. I understand that about 80% of the books being banned were titles put out by the prolific publishing house, Castle Hill Publishers (purveyors of the Holocaust Handbook series.) It’s a new low Amazon has sunk to, in banning even the most scholarly of research that questions the Holocaust narrative. It’s flagrantly Orwellian, even by the warped standards of what the west has become. Will the (((shysters))) next get Bezos to erase the banned books that are already paid for & downloaded on Kindles? You know they’d love to do that. This is a book burning. Fortunately, there are still websites selling revisionist works online. TBR and others are not going away. One may wonder, why do those who promote the official holocaust story so fear other researchers publishing their findings about it?